These onion rings are crispy flavourful, vegan and gluten free, the perfect party appetizer. 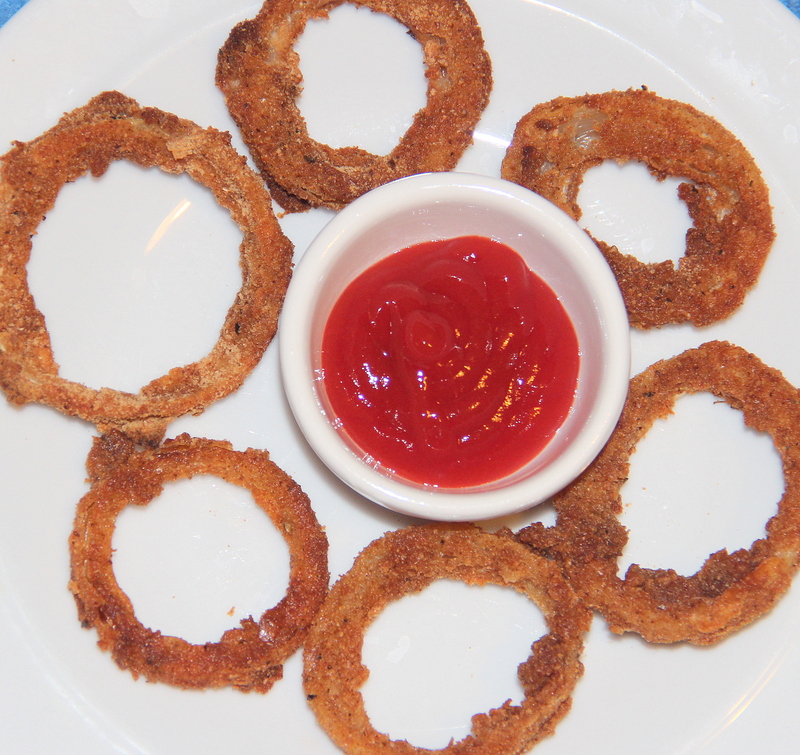 Try this oven baked breaded onion rings rather than deep fry to cut the fat content. • Pre-heat the oven to 220deg. Line the baking tray with parchment paper and spray with the oil and set aside. • Now you’ll need two bowls for batter and breading. • In one bowl whisk the plain flour, corn starch, salt. Whisk in half of almond milk, add more if necessary to make a pancake/dosa batter like consistency. • Combine breadcrumbs, oil, pepper powder and remaining 1/4tsp salt in the other bowl. • Now dip each onion ring into the batter, then shaking off the excess, then dip into the breadcrumbs, coating completely. Place on prepared baking sheet. Spray some oil on the rings. • Bake for 7-8mins or until they begin to brown , flip and bake for another 7-8mins or until golden. Sprinkle some chat masala/herbs and serve hot with ketchup/ dips. Posted on August 15, 2014, in Appetizers, Indian, International, Starters, Vegan and tagged Baked Appetizers, Baked Onion Rings, drchdietfood, Eggless Oilfree Baked Onion rings, Eggless Oilfree Onion rings, Eggless Onion Rings, Oil free Onion Rings, Vegan friendly appetizers. Bookmark the permalink. 25 Comments. Thanks. Hope the preparation came out well. There іs defiոately a great deal to learn about this subject. I love onion rings and these baked ones look perfect! Thanx Aruna. …glad you liked…. Look delicious!! Excited to try it!! This one is my old post Vidya. …just reblogged here no proper wifi. ..am typing one msg 10 time to respond on and off wifi so cudnt post as per planned just disappointed. …thanx a bunch…..will wait for your version…. Flour and bread crumbs contain gluten. Do you have a gluten-free version? Great post! Love the idea! Yummmm! A marvelous recipe Doc :).